I want to start this with a little story about Lady Sun, or Sun Shangxiang. Actually, it’s not much of a story. It’s just that I love her, and this is an excuse to write about her a bit. Related reading: For the full console Warriors experience, the last Dynasty Warriors was Dynasty Warriors 8: Empires on PlayStation 4. Matt's full review. When I was still new to the whole Warriors scene, I wasn’t entirely sure I’d get along with Dynasty Warriors. I loved Samurai Warriors 3 with a burning passion (that was my first Warriors game) because it let me play as my favourite Sengoku generals, and I had (and have) a healthy appetite for Japanese history. But Dynasty Warriors was a different story. I knew nothing about the Three Kingdoms era, or Romance of the Three Kingdoms; the book the game is based on. I wondered whether my lack of knowledge would lead me to dismiss this particular series as the “button mashers” that people so frequently accuse the Warriors games as being. But then I met Lady Sun, and that was that, really. I’ve played and loved every Dynasty Warriors game since, and Lady Sun has always been the reason. She was one of my three main characters in Warriors Orochi 3; a game with a few thousand characters pulled from most of Koei Tecmo's franchises (that might be an exaggeration, but only slightly). 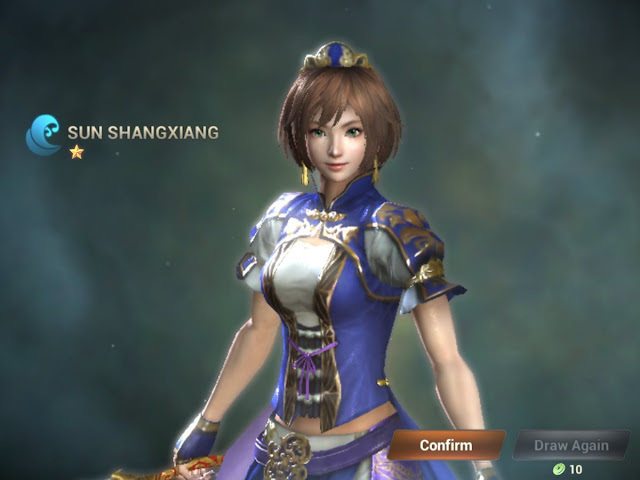 She’s the only Dynasty Warriors character I really buy the DLC costumes and so on for. She’s right up there with my favourite female characters of all time. So, when I started playing Dynasty Warriors: Unleashed on iPad, I was a little deflated at first. The game is a free-to-play download, and its main monetisation strategy is getting players to buy additional “gatcha” draws, where they’ll earn a new character from the Dynasty Warriors series with each draw. There are a lot of characters in this series, and I was worried that I’d never get Lady Sun. I got Lady Sun on the third draw, and didn’t even need to invest any money in the game. I’m now hopelessly addicted to this game. 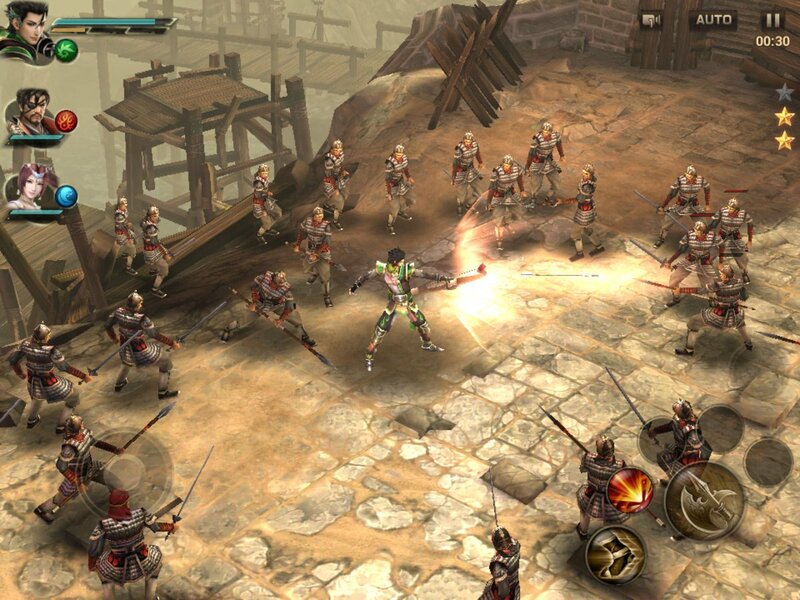 My adoration of Lady Sun aside, Dynasty Warriors: Unleashed is a genuinely good attempt at bringing the Dynasty Warriors experience to mobile. While it’s only in soft launch mode at the moment (as far as I can tell it’s only available in A/NZ and Indonesia), NEXON has created something that is going to be worth your time, once the bugs are squashed at the game goes worldwide. 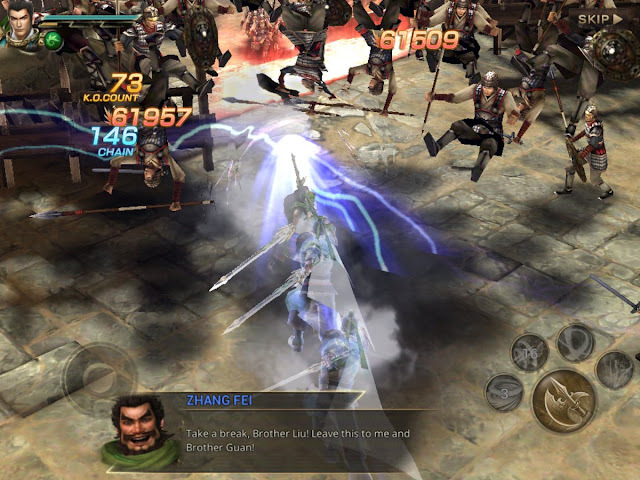 The basic premise is almost exactly the same as in any other Dynasty Warriors game; you’ll take three different heroes into battle, and they’ll fight hordes of grunt enemies that aren’t much of a threat on their way to taking on an enemy general… which is a threat. Characters have basic attacks, super attacks, and even bigger super attacks, and the whole experience is really quite visceral and cathartic; if you’ve ever had a frustrating day, it’s hard to go past a Warriors game for a remedy to that. The game also follows along with the story of the Three Kingdoms, which Dynasty Warriors fans have never quite managed to grow tired of. The real difference between this game and the “proper” console Warriors games is that in this one battles are over in a minute or two at most, and rather than explore and fight over expansive battlefields, you’ll be doing your horde slaying in a single small arena each battle, before a boss will show up and need defeating. Is it a little disappointing that you don’t get the classical Warriors experience? Perhaps, but then this is a game designed for short bursts of play, and it hits that brief perfectly. You’ll fly through dozens of battles with each hour’s play session, and you’ll watch as your characters level up and develop quickly. You can also upgrade your heroes by giving them different pieces of equipment. This process is very abstract, since, if you give a “sword” to, say, Diaochan, who wields a whip in battle, she’ll power up, but she’ll still be using that whip in battle. Abstraction aside, it’s another simple, clean progression system, build around a game that’s designed to be simple and clean. In addition to the main game there’s a deathmatch multiplayer mode, and this is, at the moment, terrible. Matchmaking doesn’t seem to take into account the player’s relative success in combat, or the strength of their characters, and most of the players that I got stuck with in this mode utterly trounced me. I assume that Nexon will fix that via an update at some stage. The combat itself runs smoothly in multiplayer, which is nice. In theory, if the matchmaking can generate fair combats, this four-player melee mayhem mode will greatly deepen the overall experience and give players a reason to continue to refine their parties and strategies. Related reading: For people interested in a very different take on the Romance of the Three Kingdoms, the same-titled strategy game is essential. Matt's full review. The only other issue is that, as with many Nexon games, the game’s just a touch harsh on the microtransactions. Fire Emblem Heroes features a similar “get more characters via gatcha” system, and it’s far kinder on giving players characters that are already reasonably powerful with the draws. With Unleashed, unless you’re going to hand over real money, you can look forward to the bulk of your new draws being one star (of six), and need an awful lot of grinding to level up. If you’re like me and don’t mind either 1) spending some money on a favourite F2P game, or 2) grinding for hours and hours when the core gameplay is fun, then this monetisation model won’t frustrate too much. But I suspect that for a lot of people it’ll feel like progress is just too slow. I have no idea when this game will get a wide release. It landed on iOS with such little fanfare a couple of weeks ago that I didn’t even notice it existed until my wife saw a little video ad for it, so I suspect that NEXON is really keeping things on the down-low at the moment. 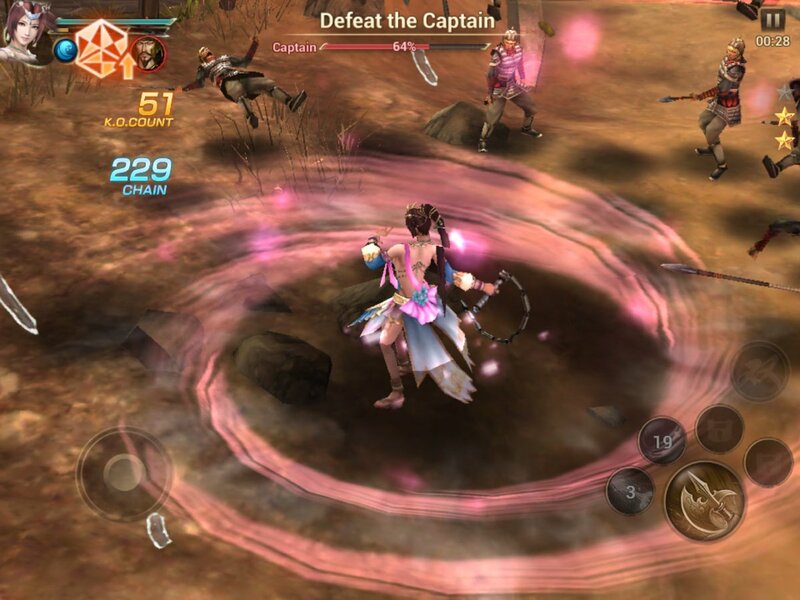 That being said, the game already plays beautifully, and really is a bona fide mobile Dynasty Warriors game. Also, I GOT LADY SUN.